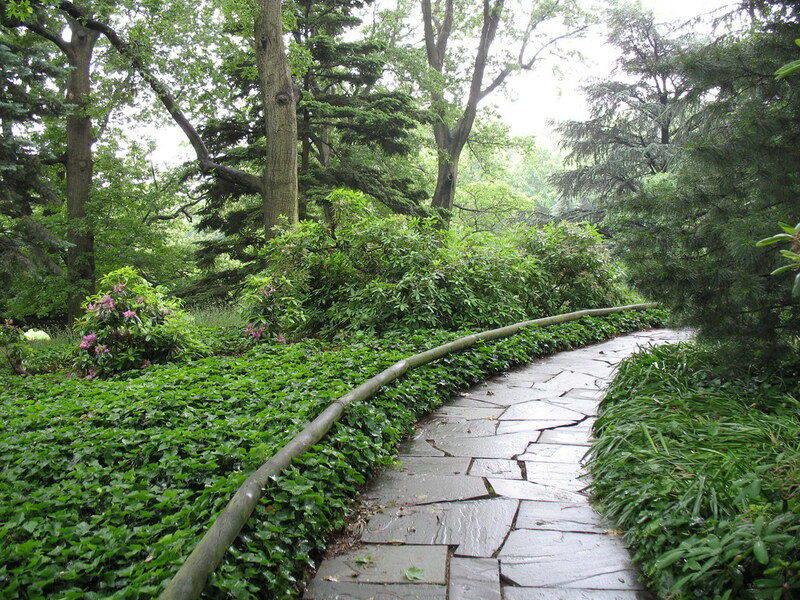 Across from the Shakespeare Garden is the start of Celebrity Path, where stepping-stones are inscribed with names of famous Brooklynites past and present. The path meanders through Austrian pines, rhododendrons, and daffodils, just south of the Japanese Hill-and-Pond Garden. At irregular intervals along the way, approximately 100 artists, poets, performers, and athletes who were born or have lived in Brooklyn are honored, from Walt Whitman to Barbra Streisand. The walkway was donated by the Brooklyn Union Gas Company in 1985. Its pavers were designed by the Brooklyn artist April Kinser. Each celebrity honored has his or her name embedded in a colored paver decorated with a stylized leaf outline in bronze. The leaves—scarlet oak, Chinese parasol tree, red-vein maple, and water-lily—were selected by BBG's former director of Horticulture Edmond O. Moulin because of their special relationships with the Garden. Scarlet oak (Quercus coccinea) is a native tree that was planted in 1916 in the Plant Family Collection as a gift from Harriet White, the sister of Alfred T. White, BBG's first major contributor. The Chinese parasol tree (Firmiana simplex), also called the phoenix tree, is a native of eastern Asia that was given to the Garden in 1925 by the Yokohama Nursery Company in Japan and planted south of the Rock Garden. The red-vein maple (Acer rufinerve) is a rare Japanese native known for its magnificent red and yellow fall foliage. The vibrantly colored water-lilies (Nymphaea species) in the pools of Lily Pool Terrace are both hardy and tropical. Each paver also contains a bronze medallion of the Brooklyn Bridge, encircled by the phrase "The Greatness of Brooklyn Is Its People." New names are periodically added to Celebrity Path. Celebrity Path. Photo By Rebecca Bullene. 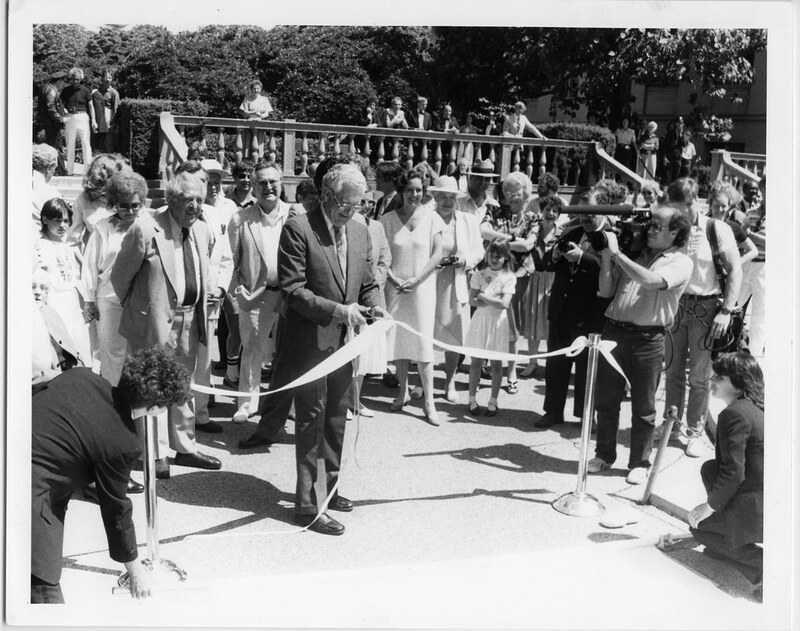 Ribbon-cutting for the first "Celebrity Path" which was on the Lily Pool Terrace. Two celebrities are in the photo, comedian Phil Foster and actor Vincent Gardenia.